Soldiers from the 173rd Airborn Brigade on a search-and-destroy patrol in 1966. The Vietnam War indelibly marked recent history. But many Americans who lived through the war – not to mention those born after – remain minimally informed about basic facts about the conflict. The Heinz History Center aims to change that with “The Vietnam War: 1945-1975.” It’s the Center’s expanded version of a New-York Historical Society show that debuted in 2017. But if the exhibit brings the war home – with a trove of personal artifacts owned by Pittsburghers who served – it also takes a longer and wider view of the conflict than is typical, says lead curator Samuel Black. "The Vietnam War: 1945-1975" runs April 13 to Sept. 22 at the Heinz History Center, 1212 Smallman St., in the Strip District. For one, note that the exhibit’s title dates the start of the conflict to 1945, when Vietnam was still struggling for independence from its colonizer, France. “We wanted to discuss the political situation in Vietnam before the American involvement in terms of troops on the ground and actual campaign of war,” says Black. Though still two decades away from sending combat troops, the U.S. aided France’s failed attempt to hang on to Vietnam. With North Vietnamese forces backed by the Soviet Union and China, Vietnam became a Cold War battleground, with a succession of American presidents convinced Vietnam was a “domino” whose fall would forfeit the rest of Southeast Asia to Communism as well. 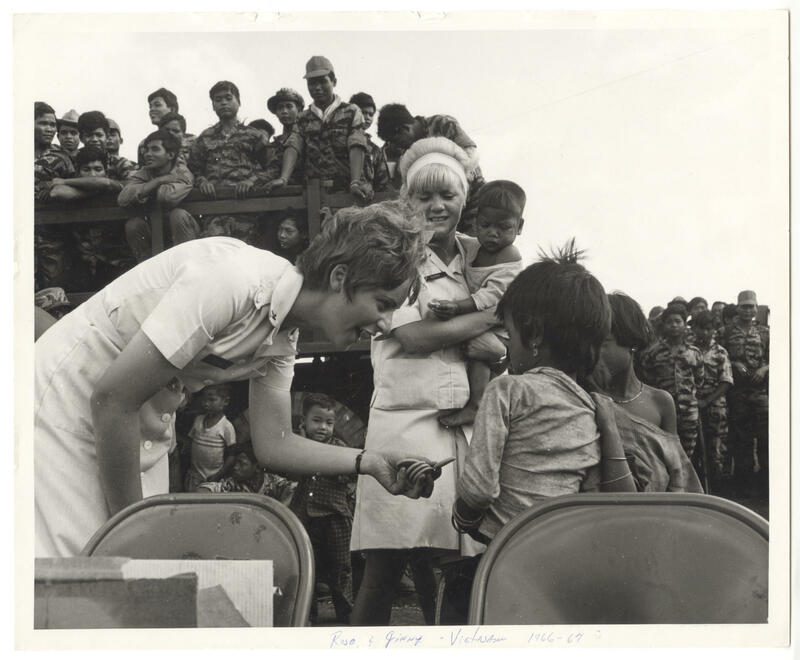 Pittsburgh's Rose Gantner hands cookies to children of the US. Allies known as the Montagnards, ca. 1966-67. Alongside this big picture, “The Vietnam War” revisits the conflict through a series of objects from room-sized to pocket-sized. The biggest is a UH-1H “Huey” helicopter that U.S. forces used to transport troops and evacuate the wounded; it's 20 feet long, with a wingspan of 48 feet. There’s also a Vietnam-era jeep mounted with an M-60 machine gun, on loan from a local collector. "Vietnam is really the first war considered a televised war." About half the exhibit consists of material curated by the History Center, says Black. The museum’s call for objects also turned up material from George Kniss, a local man who served as an Air Force photographer starting in 1963; a glass case displays Kniss' camera, hat and hand-written journal. There’s a replica hooch – combat-troop lodgings – with artifacts from local veterans including John Clark, and photographs and more from Dr. Robert Pacek, a New Kensington physician who served as a surgeon in a medical unit. Richard Narushoff, a Duquesne University graduate and Air Force navigator on B-52 bombers, contributed items including his flight helmet. Other materials were supplied by Pittsburgh women who served, like Rose Gantner, who did two tours as volunteer support staff; Pat Tucker, a high-ranking Red Cross official; and Donna Giordanni, whom History Center curator Emily Ruby says was the first American woman to be an air-traffic controller in Vietnam. The pocket-sized relics include a wall full of locally made, custom-engraved Zippo lighters used by servicemen. The artifacts range from room-sized to pocket-sized. The exhibit also explores the politics of war in the U.S., from President Lyndon Johnson’s 1967 escalation of the draft to the anti-war movement and the 1968 presidential campaign. The division between backers of the war and its opponents was heightened by the still-new media of television. 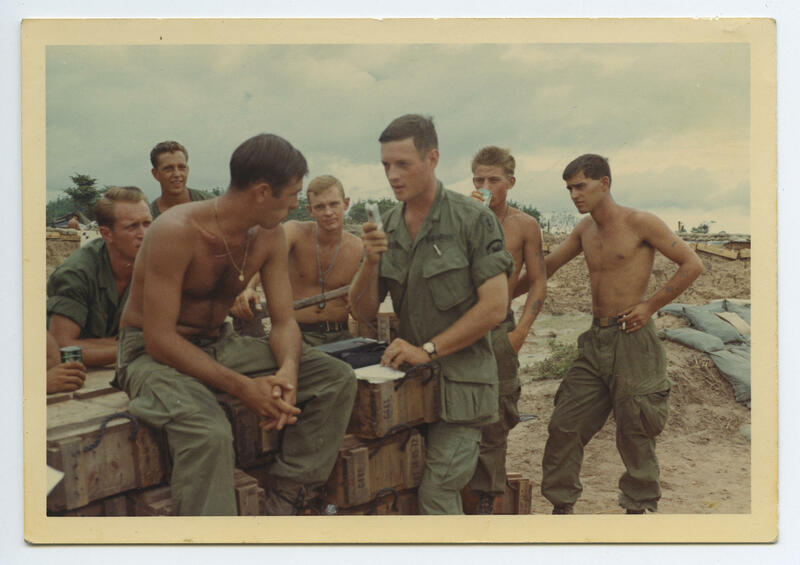 Broadcast specialist William A. Korber, a Western Pennsylvania native, interviews artillerymen in the field in 1968. The History Center suggests that experience by recreating a period living room, complete with an old-school black-and-white console television playing news programming from the period. The news reports helped turned public opinion from mostly pro-war to mostly anti-war, especially after the North Vietnamese carried out the 1968 Tet Offensive. Casualties began to mount, and the Johnson administration was no longer able to sell the narrative that the U.S. was winning. Print media also played a role: The exhibit highlights the June 1969 issue of Life magazine that ran photos of all 242 U.S. soldiers who had died in a single week. Video installations include contemporaneous interviews with families who lost loved ones in the war, in 1965 and 1970, and who discuss how it affected their feelings about the conflict. Other artifacts include the giant “Stop the War” banner two brothers hung at Three Rivers Stadium on the Pirates opening day in 1972. “The Vietnam War” mostly takes a U.S.-based perspective. But Black says that he hopes the exhibit corrects another misconception about the war, one involving our sense of how many lives the war took. Sgt. 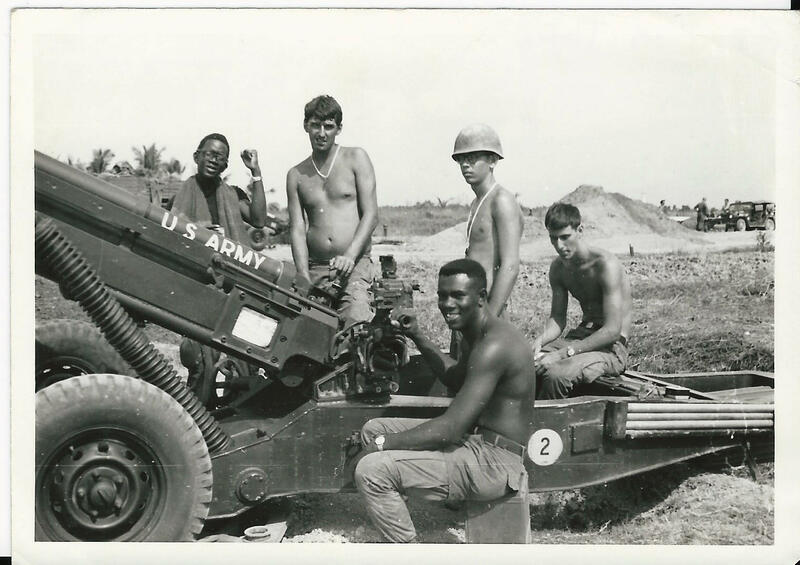 John Elm, of Pittsburgh, served in B Battery of the 1/11 Artillery, in 1968 and 1969. “We focus a lot on the 58,000 Americans [killed in action], and rightfully so, but to look at the number of Vietnamese who were killed during the war, nearly two million people, that’s a lot for any nation to undergo,” Black says. Nearly half of those Vietnamese casualties, he adds, were civilians. The exhibit’s five-month run will have guest speakers, including: Vietnam veteran and former Pittsburgh Steeler Rocky Bleier; Lynn Novick, who co-directed 2017’s PBS series “The Vietnam War” with Ken Burns; and novelist Lan Cao. There’s also a Vietnam War-themed film series and a monthly “Vietnam Voices” series, with guests from the military, the Vietnamese community, and the home front. For veterans and active-duty military, the exhibit’s entire run features discount pricing: half-price every day, and free on selected dates including opening day, the three-day Memorial Day weekend, and July 4. Allegheny Conference on Community Development Photographs, Detre Library & Archives at the History Center. At the beginning of the 20th century, flooding was not uncommon for Pittsburgh. Businesses and residents were used to dealing with spring flooding and no official action had been taken to combat rising water levels from the city’s three rivers. On St. Patrick’s Day, 1936, however, usually warm temperatures resulted in a rapid thaw of the winter ice and the city was engulfed in 46 feet of water. The Pittsburgh Tech Report for Feb. 19, 2019. The people have spoken: a token from Kennywood Park will be sent to the moon's surface as part of Pittsburgh company Astrobotic's first lunar payload, scheduled to launch in the first quarter of 2021. The African American History Commission Act was signed last year to recognize and highlight the resilience and cultural contributions of Africans and African Americans in the 400 years since they first landed in Virginia, by force as slaves. Samuel Black, director of African American programs at the Heinz History Center and immediate past president of the Association of African American Museums, joins 90.5 WESA's The Confluence to discuss the commission’s goals, Pittsburgh’s African American heritage and the cultural and historical impact on our region.